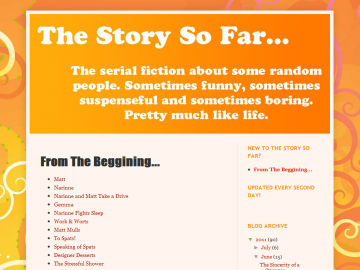 "The Serial Fiction about some random people. Sometimes Funny, Sometimes Suspenseful and Sometimes Boring - Pretty Much Like Life!" An ongoing story that is updated every second day with about 500 words per post. The story is very much character driven and follows the lives of ordinary people and their issues. Ranges from humorous to suspenseful. The story deals with issues such as religion, sexuality, relationships, workplace disputes - anything to everything. The Story So Far has not been reviewed yet. The Story So Far has not been recommended yet.